After World War II, most sea surface data were collected from ships. Then came buoys and satellites. Now, NOAA scientists want to send in the drones. “We could be making the next epochal advancement in oceanography,” says Craig McLean, NOAA’s assistant administrator for oceanic and atmospheric research and acting chief scientist. Within the next decade, hundreds or even thousands of solar- and wind-powered drones could roam the world’s oceans, using satellites to relay information gathered from the sea surface and the air above. The drones can’t come too soon for scientists who study the El Niño–Southern Oscillation, a set of shifting global temperature and rainfall patterns triggered by warm surface waters that slosh back and forth across the equatorial Pacific every few years. Since the 1980s, NOAA has supported a grid of buoys, moored to the Pacific sea floor, called the Tropical Atmosphere Ocean (TAO) array, to study and forecast these swings. Its success led to similar arrays in the Indian and Atlantic oceans. But earlier this decade, the TAO array had a near-death experience. The marine growth on buoys and their moorings are fish magnets, which makes them a magnet for fishers as well, causing the distinctive TAO grid to appear on maps of global fish catches. As fishers dragged the buoys aside for easy pickings, they damaged them, and maintenance work began to pile up. Meanwhile, budget cuts and the soaring expense of operating research ships meant few new buoys were deployed. “That was a wake-up call for all of us,” says Christopher Sabine, an oceanographer at the University of Hawaii in Honolulu. Ultimately, Congress restored funding for the TAO array, which costs about $10 million a year. But now Japan, which maintains a complementary array in the western Pacific called the Triangle Trans-Ocean Buoy Network, has pulled out almost all of its buoys because of limited funds and a lack of ship time to maintain them, degrading El Niño measurements once again. The crises prompted NOAA and others to look for a more sustainable system to deliver El Niño warnings, which help agencies plan for the heavy rains and droughts that follow in its wake. “It’s an opportunity to look at exactly what the array is and its requirements are,” says Meghan Cronin, an oceanographer at NOAA’s Pacific Marine Environmental Laboratory (PMEL) in Seattle, Washington. Richard Jenkins, an engineer and Saildrone’s founder, smelled an opportunity. He had built a sailboat on wheels called Greenbird that in 2009 broke the land-speed record for a wind-powered vehicle, reaching 202 kilometers per hour on a dry lake bed in Nevada. Afterward, he helped two ocean-minded philanthropists, Eric and Wendy Schmidt, outfit their research vessel, the R/V Falkor, at a cost of $60 million. He marveled at the expense and wondered whether a smaller, seafaring version of Greenbird could gather ocean data more cheaply. In theory, an ocean-going saildrone would need no fuel for propulsion; solar panels could power instruments and communications. Simply set waypoints and the drone would ride the wind there. The Schmidts gave Jenkins $2.5 million to get started; by 2013, a test craft had completed its first voyage from California to Hawaii, propelled by a 4.6-meter-tall carbon fiber composite sail. Since then, Saildrone has worked with PMEL scientists to rig the boats with sensors and test their limits. In 2015, they survived 40-knot winds during a 3-month foray into the Arctic to assess marine life. That success encouraged scientists to mull whether the drones could help anchor observations in the Pacific. Conceivably, the drones could sail in circles around a virtual mooring point, or run other preplanned patterns, before returning to port every year for cleaning—no ships necessary. The drones could be cheaper, too. Saildrone charges $2500 a day per drone to collect data, whereas ship time can cost $30,000 or more per day. Jenkins thinks his drones can profit off that difference in the Pacific. “We are anticipating a fleet to service that market exclusively,” he says. Eventually, the saildrones caught the wind and escaped. And as Cronin looked back at the data from the cold tongues, she discovered a surprise: shifts in water temperature by 1° in less than a kilometer. “Some of these fronts are much sharper than you would ever imagine,” Cronin says. “That was shocking.” It is the type of detail a satellite’s lower resolution would smear out, and something a stationary buoy would have missed. 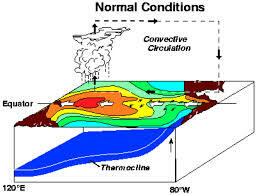 Cronin says current climate models don’t account for these sharp gradients, which could churn the atmosphere above.